Arrived home from the sunny confines of Key West on Tuesday, just in time to do a little handicapping and play a few horses at the ole’ hometown oval of Keeneland. Want to thank my great friend, ally, and super supporter Ryan Dickey for pinch-hitting for me last week. What a great guy. 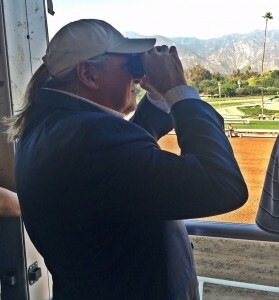 And, a good handicapper – to boot. Despite his bout with pneumonia, he soldiered on and allowed me to play fun in the sun and get a little R&R before “Derby 2019” fully descends upon us all. Thanks so much Ryno. You are the best. 1st: 5/7-4/3-6…Honey Bunny (5) is wheeling right back on 13 days after winning here at the 7 furlong distance on April 4. The barn hits with .23% of those that won the last race, and this one has now won two in a row for a top young trainer. Gets the same rider who has piloted the wins, and looks much the best on paper. Must be feeling real good right now to come back this quick. Has a 1-1-1 record in 3 starts here previously, as well. No odds, but appears to be our first Key Play of the Day. I bet the 5 to win (only) and key the 5 over the 7-4-3-6 in the exacta. 2nd: 3-4-6/2-1-7…Wide open affair here, or so it appears to be. I land on Picasso Moon (3), who ships down from Ohio to tackle the Keeneland ranks today. Before going there, though, this 5YO Elusive Quality mare ran well against better over the poly at Woodbine. Looks good right now and should fit with these at some odds. Loran Holiday (4) is the likely favorite and comes in off a nice win down at Oaklawn Park. Loses that condition, though, and has to face tougher in here. Our top pick has won 4 races to date, which is one more than this one. Top rider does take the reins in this one. The one to beat. Nymue’s Treasure (6) was claimed last time out at Turfway Park by a sneaky good barn. Would not be a surprise to see this one improve off that effort and be in condition late in this one. I bet the 3 to win/place/show and then box the top 3 numbers in the exacta. 3rd: 8-2/4-7/10…Biddy Duke (8) is 5-1 in the ML odds, and may drift North from there, considering that Wesley Ward (the mastermind trainer for these 2YO baby races) has two entered. But Biddy Duke — a 2YO daughter of Bayern — has been training lights out for the barn of John Ennis. If she can break well, look out. Jockey gets on a lot of those Ward horses, as well, but lands here. Interesting. Chili Petin (2) is one of the Ward fillies. This daughter of City Zip has been training well, as well, and gets the services of HOF rider John Velazquez. Outworked the barn mate a couple of works ago, and appears to be the best of the Ward duo. I bet the 8 to win/place/show and then key the 8 over/under the rest of the numbers listed. 4th: 5-7/6-2-1/3…Rockin Ready (5) is shipping in from the West Coast and ready to make the 2019 debut for trainer Phil D’Amato. Has not run since last July. Long break. But the a.m. training sessions have been good — especially at Santa Anita, before the ship East. Gets a top rider in the irons, and will be making the first trip at this distance. But does have 1 win and 4 seconds in 6 starts over the grass. Ran second by a nose to Tointe in the career debut and has faced some good ones in the past. May be a venerable fav, though, with the layup and cutback in distance. Tap Tap Taparoo (7) is an expert at this short, sprint, grass distance. In 3 starts, she has a win and 2 seconds and comes in off two seconds in a row. Regular rider stays up here. Love the work here on April 13. I bet the 7 (Take Note) to win/place/show and then box the 7-5 in on exacta. I will key the 5-7 over (only) the 6-2-1-3. 5th: 2-7/4-5/9-10…Wesley Ward has loaded up in this “baby race,” as well, with two more fillies that appear ready to pop. the top one of the duo appears to be Nayibeth (2) — who cost $230,000 to purchase at the Fast-Tipton October Sale a year ago. Since, she has trained very well for a guy that knows how to get them ready early on and often. Barn hits with .29% of first time staters and the dam of this one has 3 winners from 5 starters — including a Stakes winner. Rider is super hot, as well, with 6-3-1 mark in the last 7 days here. Owlette (7) is the other “Ward Horse,” in this group. Ontario-bred has been a bit more tardy in the a.m. that the entry mate, but gets a HOF jock up and should come running a bit off the pace. I bet the 2 to win/place/show and then box the 2-7 in one exacta. I will key the 2 over (only) the 7-4-5-9-10 in a smaller version. 6th: 4-2-5/6-7-(13)-(15)/9-8-3…Trade Deadline (4) hails from the barn of Chad Brown, who is having another super meet in the Bluegrass. Sits atop the Trainer Standings going into today’s action, and this one should not hurt his chances of adding to this local resume. Ran once at GP in February, and went off at odds-on favorite. Made all the pace before tiring at the end of that one. Gets a new rider today, and has trained well since that race. Son of Kitten’s Joy, whose progeny run well over this course, too. One to beat for a barn that has .32% winners here this meet. Kid Lemuel (2) is my Upset Special of the Day, coming into this one with 10-1 ML odds. Rider has been ice cold here this meet, but is sure to heat up soon. Too good to stay idle for very long. This one ran second to Henley’s Joy on debut last summer at Ellis Park. That one has gone on to be a real good runner. Kid has not been out since August, but training well for a barn that wins with .12% off this long and with .28% of those returning as a beaten favorite. Bourbon Calling (5) goes for trainer Ian Wilkes, who is having a solid meet here, as well. This one will be getting the grass for the first time, but the dam of this one has a grass winner from 2 starters. May move up at some nice odds. I bet the 4-2 across the board and then box the top 3 numbers in one exacta. 7th: 2-3/5-1-4/6…McCormick (2), a 5YO son of Hard Spun and trained by Ian Wilkes, was cut out to be a real good one early in the career. Beat Silver Dust just before running second to Hence in the 2017, G3 Iowa Derby. Looked to be a on a good path. Since then, though, he has hit the board only twice in the last 8 races. Was 0-for-3 in ’18. Currently, 0-for-2 in ’19. Now, gets dropped into the claiming ranks for the first time in hopes that he may wake up a bit. Barn hits with .11% of those kind, and with .22% of those moving from the grass to the dirt. Dirt is where he has done the best. Like the jockey selected here, too. Stone Hands (3) is a Santa Anita invader for a top barn operator. Has been working well and should be the one to beat, under one of the hottest riders in the land right now. Jockey and trainer have teamed up for 3 wins in the last 3 starts together. Barn hits with .19% of those returning as a beaten favorite. I bet the 3 to win/place (Take Note) and then box the 3-2 in one exacta. I will key the 3 over / under the 2-5-1-4-6 in two smaller versions. 8th: 8-12-1/7-4/3-10/2-11…The finale today is a 11/2-mile marathon over the sod, and an interesting betting race, to boot. I will give the slight edge to Neepawa (8), who will be making his second start of the season. Ran 8th in the 2019 debut on March 30 at GP, and didn’t show much in that one. Off slow and then wide in that one. This one needs to be either on or close to the lead. Gets an aggressive gate rider today, and that make stoke this one to be a little more keep in the early going. Look for more today. Sarrasin (12) ran OK in the 2019 debut on March 24 at Tampa Bay. That was the first start since last July at Saratoga. Needed it for sure. Got a bit tired at the end of that one. If he improves off that conditioning, he may be a factor in the late going here. Interesting Note: Lost to the grand Winx in Australia on Sept. 2, 2017. The horse that I really, truly like in here, though, is Krewe Chief (1) — who is coming over to the turf after two straight tries in Graded Stakes on the dirt at the Fair Grounds. No threat in those, but the two grass races that show on the PPs are both nice. And, this one does have a 1-4-1 record in 12 turf starts to date. Love the work on April 6. Looks like he’s another that may try the front in this marathon gallop. I bet the 8-1 across the board and then box the top 3 in the exacta. I will key the 8-1 over/under the 12-7-4-3-10 in two smaller versions.